Reports: At least 10 dead after explosions rock Istanbul airport, Turkish justice minister says. 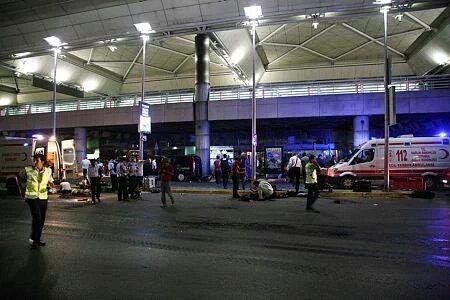 At least 10 people have died and multiple numbers have been injured after at least two explosions and gunfire Tuesday at Ataturk International Airport in Istanbul, Turkey, according to various reports. Gunfire came from an airport parking lot, one witness told the BBC. At least 10 people were dead, Reuters reported. Another explosion in December at another airport in Istanbul left one dead. Ataturk is the largest airport in Turkey. Recent bomb attacks in Turkey have been linked to Islamic State or Kurdish separatists, according to the BBC. Photos posted on social media showed people on the ground inside and outside the terminal.